Analysis at the project level is necessary for moving toward answers. Given OBOR’s intended reach, local challenges may vary widely. As a practical matter, each project can only be understood in its local context. Case studies of individual projects can also shed light on commonalities, helping to explore OBOR’s drivers and implications. This brief essay begins that investigation by looking at two OBOR projects: Khorgos Gateway on the Kazakh-Chinese border and the Padma Bridge in Bangladesh. The goal is not to pass judgment on OBOR’s overall prospects, which could take years to assess and even longer to fully unfold. But it begins to lay the groundwork for a more comprehensive investigation. In particular, both cases illustrate the significant economic potential of today’s projects as well as the considerable barriers they’ll need to overcome. In some areas, OBOR is beginning to challenge the economic status quo. Six years ago, one stretch of the Chinese-Kazakh border, captured in the image below, was relatively vacant. It’s about 90 kilometers away from the nearest major city. Centuries ago, it was a transit point on the Silk Road. Today, those ancient routes could be reawakening. A key part of China’s “One Belt, One Road” initiative, this area is now home to a massive industrial zone and logistics center called Khorgos Gateway. It’s equipped with customs and immigration facilities, cranes for switching containers between different railroad gauges, and dormitories for thousands of workers. Some have said this spot could become a “New Dubai” if rail transport between Asia and Europe takes off in the coming years. By 2020, they estimate economic activity here will have increased 20-fold, supporting 50,000 jobs. For context, that’s roughly 40 percent of the surrounding district’s current population. But success of these new overland routes is far from assured. Compared to sea freight, rail cuts the travel time between Asia and Europe in half. However, it’s also 2-5 times more expensive, which is one reason why 90 percent of today’s international trade travels by sea. To be sure, paying more for faster service makes sense for some products. In some cases, the additional transportation cost can be offset by lower inventory costs. Looking ahead, at least three challenges suggest maritime shipping could remain dominant. First, the shipping industry is overcapacity, compelling shipping companies to slash costs and even merge. Second, artic sea lanes are becoming more accessible. Finally, there are trade imbalances between Europe and China that make it difficult to sustain rail operations, underscored by the fact that a significant portion of rail containers return to China empty. Of course, each of these factors could change in the future. For example, as Asian incomes rise, demand for European exports could increase. For the foreseeable future, however, each presents a significant challenge to the viability of new Asia-Europe overland routes. 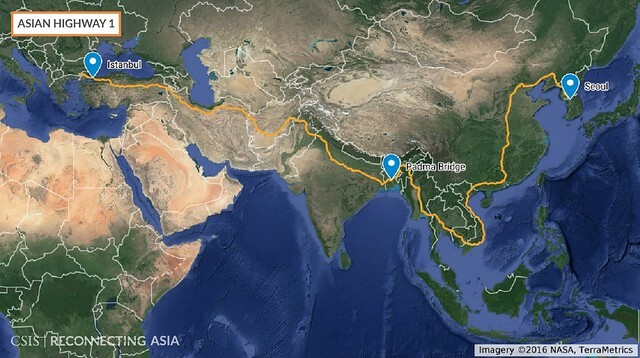 In Bangladesh, OBOR is capitalizing on previous efforts to improve South Asian connectivity. 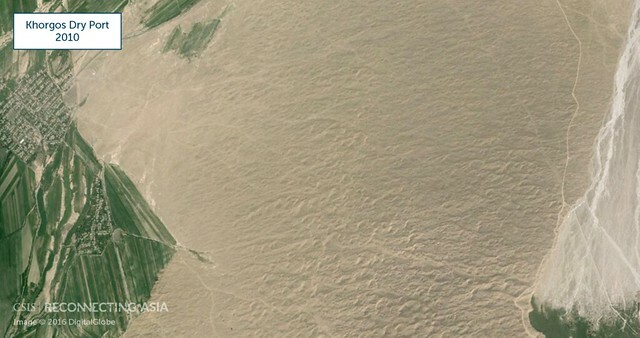 The site of Bangladesh’s largest development project is captured below. The roads and other features are part of a bridge project that was started in 2011. It is a giant endeavor, one that has required relocating over 70,000 people. According to one estimate, the bridge could boost Bangladesh’s GDP by 1.2 percent. But the project barely got off the ground before evidence of corruption led a number of organizations, including the World Bank and Asian Development Bank, to withdraw their support. The project has continued with other sources of funding, and officials visiting the site have sought to underscore the work that has been completed. But its anticipated cost has climbed by over $1 billion, and progress has been slow, as the picture below illustrates. This project has been part of different initiatives. Arguably, it was part of Japan’s vision for the region before the corruption scandal. But Chinese state-owned companies have been working on the bridge since 2014, and Bangladesh formally joining OBOR last month. Furthermore, the bridge is also part of Asian Highway 1, a road network that was conceived by the United Nations in the late 1950s and intended to stretch across the continent (illustrated below). In at least three respects, this project’s history is telling of the broader infrastructure push that’s underway. First, it is a reminder that many of the projects identified with OBOR actually predate OBOR. That is true with some other high profile efforts as well, including the China-Pakistan Economic Corridor. More generally, the idea of promoting connectivity through infrastructure is nothing new. Analysts should approach these projects with a longer historical perspective. Second, the stakes of an individual project can extend well beyond its immediate area. There are other missing links along Asia Highway 1, but completing the Padma Bridge would be an important step forward for regional connectivity. When examining individual projects, it is important to take into account the broader networks of which they are (or could be) a part. Finally, the positive impact of new hard infrastructure will depend heavily on upgrading the region’s “soft” infrastructure. Imagine for a moment that every piece of Asian Highway 1 is completed. There would still be plenty of barriers to overcome: inefficient customs procedures, laws requiring goods to be unloaded and put on local trucks, and of course, corruption. It could take decades for OBOR to unfold. But it is a development that is worthy of greater attention from U.S. researchers and policymakers today. Further research could be helpful in a number of areas. Most obviously, more projects should be examined, with greater rigor for case selection and in greater numbers overall. Priority should be placed on collecting and verifying project data, which varies greatly in transparency and quality. OBOR’s interactions with other regional economic initiatives should also be examined. While China may be the biggest spender, it is far from the only consequential actor. For example, senior officials in China and Russia have discussed linking OBOR with the Eurasian Economic Union. Furthermore, many other nations address infrastructure in their national development plans. The degree to which OBOR supports, or conflicts, with those existing plans could be an important indicator of its long-term viability. It is easy to be skeptical about some of these efforts. There are huge obstacles to overcome, particularly for new overland routes. Yet it would be a mistake to dismiss these projects given their collective magnitude. Even in the best business environments, mega projects are typically delivered at higher cost and over a longer timeframe than initially anticipated. As many of OBOR’s projects are being undertaken in difficult political and security environments, it should be no surprise that some are encountering difficulties. Moreover, even projects that are not economically viable should not be dismissed. While economics might be the most important long-term determinant of project success, some projects could be driven (and sustained) by other motives. Infrastructure projects, therefore, can be important windows into national interests and ambitions. History also urges caution. Last century’s infrastructure projects created new economic opportunities, reshaped relationships within and between states, and even served as catalysts of, and instruments for, war. As the world’s economic center of gravity moves east, today’s projects could preview a new order that is emerging. Jonathan Hillman is the Director of the Reconnecting Asia Project at the Center for Strategic and International Studies.